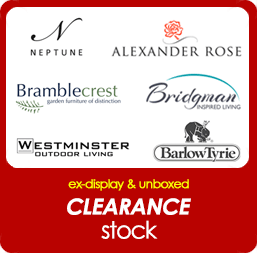 FREE DELIVERY on Alexander Rose Garden Furniture orders over £499! FREE Delivery on Barlow Tyrie Garden Furniture orders over £499! FREE Delivery on Bramblecrest Garden Furniture orders over £499! FREE Delivery on Bridgman Garden Furniture orders over £499! FREE Delivery on Gloster Garden Furniture orders over £499! FREE Delivery on Neptune Furniture orders over £499! FREE DELIVERY on Sika Design Garden Furniture orders over £499! FREE Delivery on Vincent Sheppard Furniture orders over £499! FREE Delivery on Westminster Garden Furniture orders over £499! FREE Delivery on orders over £499! *Delivery is typically within 5-10 days. If for any reason, delivery is likely to take longer, we will contact you as soon as possible to notify you of this. © 2019 The Garden Furniture & Interiors Co. All rights reserved.